It has been established that robots can easily perform tasks that we give them. But, it was noticed that the digits of their robotic arms were missing a certain dexterity when the bots held or picked up objects with odd structures and those of smaller configurations, sometimes squashing or destroying them. 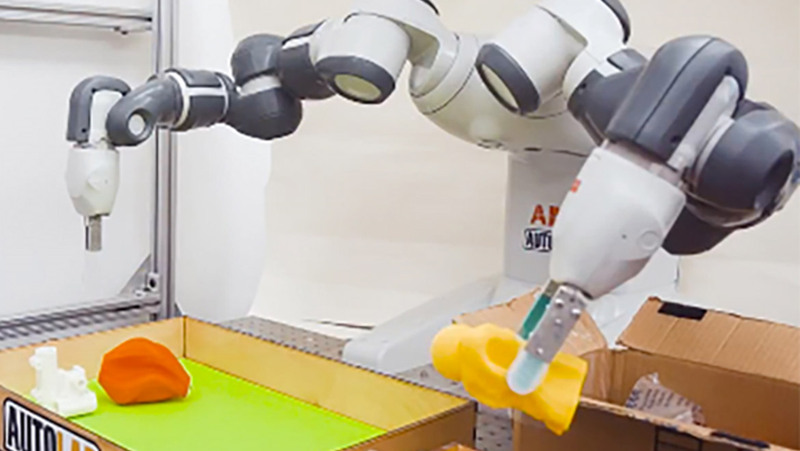 Scientists at the Laboratory for Automation Science and Engineering (AUTOLAB) at UC Berkeley, led by Prof. Ken Goldberg, developed an adept, gentle and highly nimble robot, known as Dexterity Network (DexNet) 2.0. Concepts called deep learning and cloud robotics were used to incorporate a ‘memory’ into the bot so that it familiarized itself with a huge database (6.7 million data points, to be precise) of irregular 3D shapes and sizes. The robot was also able to differentiate between these different objects during experiments with real-world interactions. Finger movements and dexterity were improved to 99%, accuracy with the bot failing to pick up only one test object from the given 40. So, in a sense, the researchers managed to impart both theoretical and practical learning to the robot. What a novel reform to automation! Co-researcher, Jeff Mehler, said, “We can generate sufficient training data for deep neural networks in a day or so instead of running months of physical trials on a real robot.” DexNet finds application in many different industries, including manufacturing, automobile and construction. When an object is placed in front of the latest version of DexNet, which is connected to the software via a sensor, it reads the shape and selects from its system an appropriate grip that can handle it, for example the robot will lift or move the item with both discipline and care. So, what this deep learning technique essentially does is mimic the human neural network, especially a part of the cortex related to thinking. Typically, the software in a bot is trained to observe images and patterns, listen to sound clips or be exposed to any such data, therefore acting like an artificial system of layers and layers of neurons. For DexNet 2.0, the learning involved highly advanced mathematical formulae and computer processors in order to achieve precision in its performance.